Note: In 2011 Seri Melaka and its sister restaurant Neo of Melaka merged, and operated at 6133 E. Broadway under the name Neo Malaysian Kitchen. Neo of Melaka used to be located at 1765 E. River Rd. (this location is now closed). The former Seri Melaka at 6133 E. Broadway is reviewed here. Reviews on other sites indicate that both restaurants had the same owners and served the same food. 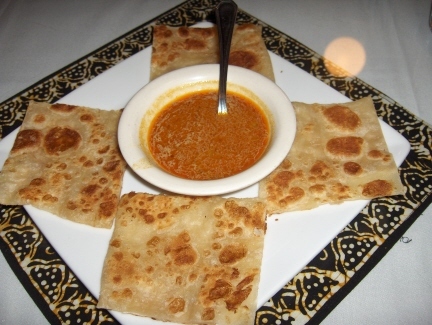 Articles on the web say Neo Melaka closed in 2017 after serving Malaysian food in Tucson for 26 years. 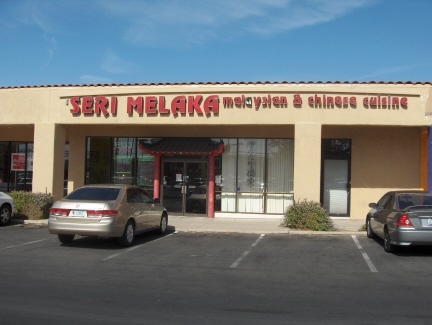 A sign of how little the American public knows about Malaysian food is the fact that Seri Melaka, a restaurant in Tucson run by an experienced Malaysian cook, also offers Chinese food. I do not fault the restaurant for trying to attract all the business it can, but I think it is well worthwhile to become familar with one of the outstanding cuisines of Asian from a country that lies between Thailand and Indonesia, both with extremely rich and varied cuisines of their own. Singapore is a tiny independent state at the southern tip of Malaysia, and I understand the owner has adopted dishes from that country as well, creating a varied menu that just about any Asian food lover will enjoy. The Chinese food at Seri Melaka is actually not so much an accommodation to American taste as a reflection of the fact that there is a large ethnic Chinese population throughout Southeast Asia including Malaysia. As the cultures blend together it usually creates a fusion effect of using the best of both cuisines. While some may come to Seri Melaka, or its sister restaurant Neo of Melaka in north Tucson, only wishing to venture as far as the Chinese menu, I believe it will be served with a slightly different twist than is found in the typical Chinese restaurant. Malaysian food became one of my favorite Asian cuisines when I tried Malay Satay Hut in Seattle, a well known Malaysian restaurant that has now expanded to Portland. Compared to Malay Satay Hut the menu at Seri Melaka is quite small, but this is mainly due to the numerous specials, particularly seafood specials, that Malay Satay Hut is able to offer. Malaysian cuisine can be one of the spiciest found in Asia, but is not always so. I would say that while nothing I have tried at either restaurant tasted exactly like Thai food, the same type of flavors that make one appreciate Thai food would also be evident in Malaysian food. One of the few things I found disappointing at Malay Satay Hut was a flatbread appetizer called Roti Canai. At Seri Melaka, though, I found it to be spot on in terms of the flavor and freshness. This type of bread can become quite greasy but it was not so at Seri Melaka. The red curry was delicious and fresh, and I would doubt that anyone could prepare this traditional dish much better than this one. Other appetizers are available, and now that I know how good this one was, I would be tempted to try any of the others that I could. I usually do not like to spend the extra money for appetizers in Asian restaurants, but I thought it was well worthwhile for this one. The owner is present in the restaurant to advise customers about how to order. I usually try to talk to the owner or manager at Asian restaurants to find out what would be the recommended dishes based on my past expeiences and my preferences. Many times I find such conversations to end up being of little value, but I was impressed that the owner of Seri Melaka was not only able to find suitable dishes for both me and my dining companion, but she seemed to make a special effort to cover all the bases and make sure we were getting the best dishes. I think this is one reason the restaurant has gained acceptance in a city where most of the choices for Asian food seem to be Chinese buffets. I think if Americans venture out to try other cuisines, they will like them. Seri Melaka seems to prove this point (although I do think you have to like spicy food to really appreciate Malaysian cuisine). A moderately spicy dish served is Lemak, described on the menu as "savory and mild." Like Arizona style Mexican food, being mild does not imply that the food has to be flavorless. The lemak is described on the menu as having subtle flavors of garlic, turmeric, lemongrass, and coconut cream. It was similar to a yellow curry with the tartness of tomatoes and the sweetness of pineapple. I generally like anything with lemongrass, and this dish was also enjoyable because of the "sweet and sour" elements that were included. It comes with a choice of meats or tofu, and the lunch portion is substantially less expensive than the full dinner plate. I very much like the idea of lunch servings so that we can either try additional dishes if we are hungry, or go away from the restaurant less than stuffed if we have plans for an interesting dinner. 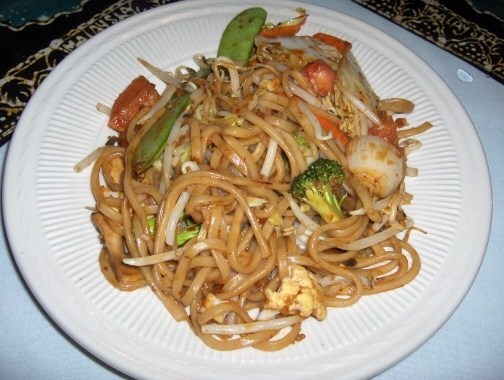 Mee Goreng was another of the restaurant's popular dishes that is offered on the lunch menu, made with lo mein noodles and a spicy shrimp paste. I asked for it to be slightly spicier than the default "mild" version, and I thought the way it was prepared followed the Asian heat scale, and not one that some restaurants use that seem to follow American expectations. Anyone who is unsure can order it mild, and more spiciness can be added later. The shrimp paste used in the mee goreng seemed to provide the strongest flavor of this dish, a flavor that I found more pronounced than in some of the Thai dishes that use fish sauce. This dish is certainly not for everybody, and I probably ended up enjoying my sample of the lemak slightly more, but I also felt that the meal was enhanced by being able to eat both dishes, as well as the appetizer. If you have never had Malaysian food before, I would recommend going with a friend and ordering different dishes. I think there is something for just about every taste here if you can just figure out what it is. If you like Thai food, though, I think you will like this. The hot tea was excellent, and the restaurant serves beer. Another choice would be the Malaysian Ice Tea I saw on the menu but did not try.